The map of this storm is incorrect. It touched down on top of a little church at Merrill and Midway and headed east. It lifted off of the ground and dangled over some very expensive homes, including Ross Perot's property. It touched down again on Lobello a few meters east of Inwood, and followed Lobello to Netherlands. From there it crossed an open field that is now high-dollar homes and hopped over the North Dallas Tollway. It went through the parking lot of the apartments, ripping up the carport, between the Tollway and Preston Royal Shopping Center. It ripped off the outer wall of Royal Bank (name might be wrong) and crossed over Preston Road. It tried to lift the roof off of the cinder block structure that was a Conoco gas station, then exited the shopping center at the southeast entrance (Mum Place and Camelia Drive). It took a left turn on Orchid (winds tore up the fence and nets of the tennis courts at St. Mark's School), then a right on Tibbs, then a left on Pemberton, then a right on Edgemere, then a left on Northport (yes, it was following the roads...tearing up trees and power lines, but minimal home damage). It lifted again while on Northport. I heard that it dangled in the air as it traveled east and touched down again briefly in the Mesquite area, but can't verify that. I watched it from the corner of Glendora and Edgemere. I second Chris-C's post. 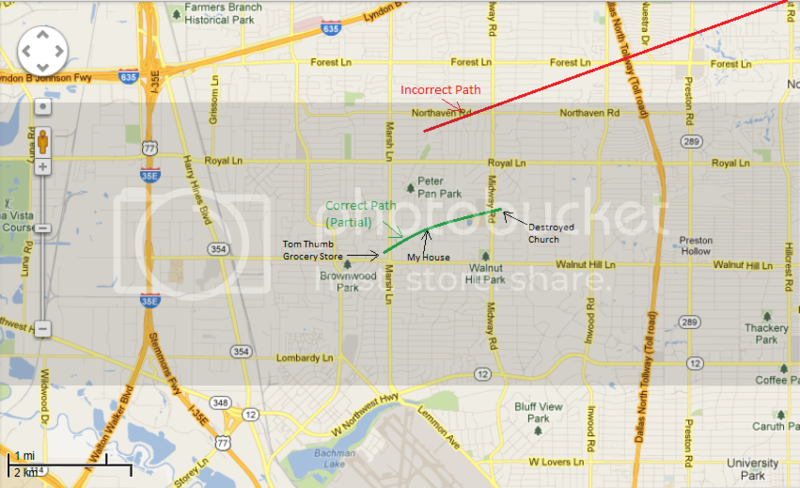 The tornado route as shown above is not accurate. I was in high school at Ursuline Academy at that time, and I distinctly remember the church at Merrell and Midway getting roof damage (at least) from the tornado hit. (I rode my bike to/from school; my route took me right by the church at Merrell and Midway and that very day I had ridden by the church on my bike maybe 90 minutes before the tornado strike.) I went with my mom after the storm (in her car) and we saw damage to the church roof and steeple. As I recall, classmates living in the vicinity of Merrell/Midway/Royal and Preston/Royal area reported some damage in their neighborhoods. I third Chris-C's post. The path is not accurate. The path was much further south than illustrated. I was in 5th grade at the time. We lived on Somerton Dr. just North of Merrell Rd. My sister and I were in our backyard collecting hail stones when heard a load roar. We looked to the south and saw it coming. We ran into the house and watched it tear down Merrell Rd. hitting the church at Midway. Afterwards we got on our bikes to survey the damage and saw roofs torn off and trees down on Better and Best Dr. just North of Cary Middle School. A day that will never be forgotten. Definitely the wrong path. I lived only three houses away from the church. The church was on Merrell and Midway, and I lived on Bonham, the street bordering the parking lot of the church. Several houses on my street lost roofs. My grandparents, who lived across the street from us on Bonham, nearly had their house destroyed by an enormous oak tree that was sucked from the ground, roots and all, and landed on the front part of their home. I was in third grade at Walnut Hill Elementary, but have absolutely the most vivid memories of the evening this happened. The tornado was preceeded by some rather large hail that my brother and I were fascinated with collecting. We actually saw the tornado coming and ran back into the house. Our windows were blown out, and we had quite a bit of debris from the church land on our roof and in our backyard, but that was the extent of our damage. Others were not so lucky! Let me add another comment to the fact that the path shown is very off. I believe it touched down along Walnut Hill, around a mile of less East of Harry Hines. It did some damage to an office/warehouse there. I also remember the church, I believe it was as Baptist church. I believe that Chris is correct in that there was some damage at the Preston Royal shopping center. I friend of mine that has died since, lived on Orchid and she remembered the damage done to fences and such back of her---I think she had to replace her fence. Please try to correct the path, The Dallas Morning News had an excellent picture of it crossing the Tollway at rush hour. This path is incorrect. I witnessed this tornado first hand as it past directly above my head. It was a big deal to me and my neighbors and I remember it vividly. I have been interested in tornados ever since. During the storm, I was collecting bigger than golf ball sized hail and running back and forth to the freezer as my mom was chasing me with the mop. After about 3 trips I ran back outside and all of a sudden it was eerily quiet. The birds were chirping, I looked up and saw a several clouds twisting together. I ran under my favorite elm tree across the driveway to intercept it and got directly underneath it. I looked up and saw the clouds rotating like "spin art" and was completely mesmerized. I saw this "thing" and I really didn't know what it was. I chased it anyway until I was stopped by my neighbors fence as it moved east north east at about 15-20 mph. Back in the 1970's film footage of tornados was very rare and most pictures just showed a dark "V" shape on the horizon. It wasn't until the tornado moved on and dropped down to form the classic "V" shape that I knew for sure it was a tornado. I climbed my favorite tree and watched it peel the roof and attic off a house on or near Gooding Street @ Merrell Road. The tornado continued east north east ripping up trees near the "rock quarry" as it went. The tornado turned darker and kind of a pinkish brown color which may have been all the bricks and debris that used to be the church at Midway and Merrell Road. While I watched the tornado heading toward the church, I noticed a giant "debris ring" up near cloud base about 1/4 - 1/2 mile high. The objects that made a near complete circle around the tornado were fluttering down landing throughout the neighborhood. I watched as the Tom Thumb Grocery store "delicatessen" sign landed in a nearby tree. I retrieved the sign and gave it to my sister. Jim, etc are correct. I worked @ the Baskin Robins next door to Lantrips Phamacy and across from the Tom Thumb... busiest night ever after the storm passed such that the owner stayed open to almost midnight and we where jam packed all night long. My arm was sore from digging out all those scoops of ice cream. The tornado hit prior to my work scheduled that night. The plate glass window that spanned the front of the store was shattered by another piece of the Tom Thumb sign. One of the guys working saw the tornado coming down and yelled for everyone to get in the back in the walk in freezer.. some customers slowly followed his guidance until the first piece shattered the window.. and they then ran into the back. Another co-worker lived somehwere near the church on Merrill @ Midway and he was in his car that was picked up and moved sand then sat down by the tornado across the street. Part of the roof of his house disappeared as this was going on. I ran outside our house in the southwest quadrant of WalnutHill and Midway area and saw debrit circling in the sky as also described above... as it hovered above Walnut Hill Elementry just north east of our house. It was surreal to say the least.. our neighbor's oldest son was screaming at us to get back inside... odd that he himself was out watching as we were... Several metal sheds from houses on Fieldfare on the west side of WalnutHill Elementary were drafted into the air by the force of the side winds knocking down wood fences along the street. The path is definitely incorrect. I grew up on College Park Drive and Welch Road. When I got home from Mary Boswell school that afternoon it was storming like crazy. I too remember going outside and picking up golf ball size hail. I remember being in the backyard and seeing the funnel cloud rotating and watched the tornado come down. One of my neighbors on the other end of College Park and Northaven had some roof shingles blown off their house. After the storm had passed, my parents took my sister and I out driving around the damage areas off Midway and Merrill. I remember seeing a house with the roof ripped off and saw purple walls on the inside of the house. I don't know why I remember that so well, just one of those unique associations. I had some cousins that had lived on Ursula Lane right off Inwood at the time. The tornado had gone down their street and did in fact uproot a large oak tree in a vacant field next to the North Dallas Toll Road. Today there is a neighbor hood where the oak tree was. Does anyone remember eating at Pulido's Mexican food? The Tom Thumb grocery store in the same parking lot also got damage to the roof. Agree on the path of the storm. I was a freshman in high school that day, studying for finals at home when I noticed something strange in the weather or air pressure, went to look out the west-facing door of our house and saw a tornado coming. I lived on the northeast corner of Welch and Isabella at the time, less than a mile from the church at Midway and Merrell that got crushed - roof smashed in by the tornado. I ran to tell my mom, who was on the phone, then went back to check the door. It was definitely a tornado and it was coming straight at us. As I ran back down the hall to find my mom windows started popping. We ran to the northeast corner of the house and got in a closet filled with clothes for padding, then realized my sister wasn't with us. We ran back down the hall, calling for her - at this point the tornado was over us and while we were yelling for my sister we couldn't hear our voices. The noise was really loud! By the time we found my sister and got back to the closet the tornado had passed, so we started checking for damage. Our living room was damaged badly - large pane glass broken and all the furniture pushed against one wall - but otherwise we only lost a few trees. Our neighbors at the corner of Isabella and Lennox lost their entire roof, lifted from their house and set down in the front yard. I don't know exactly where it went from there, but the path from Merrell and Midway to Welch and Isabella is certain. I did not realize it was an F3. The strangest thiing was a smaller tree in our back yard, ripped from the ground like a matchstick. We never found the tree, just the trunk at ground level, ripped clean. Agree that the path listed is not correct. I lived on Meadowdale which is just slightly North East of the church mentioned (Merrell & Midway). The steps from the church ended up in our back yard and trees were torn out of the ground at our house. My sister was also at Ursuline at the time and I was about 6 or 7 and just got home from school at St. Monica. I was watching TV when my father called us and told us to take cover because he could see the tornado heading our way. Fortunately, my sister was learning about tornadoes at school at the time and knew exactly how to prepare....my first experience with a tornadoe and will never forget it. Here is an accurate link (above). LOVE reading y'alls stories...I saw this tornado out the back window of my parents staion wagon. This is the event that go me interested in weather. I am now the Chief Meteorologist at KRLD 1080am Radio in DAllas, Forth Worth. Descuento Christian Louboutin zapatos de toma de corriente, descuento grande para usted! Ugg laarzen. | Ugg | Ugg laarzen.